Dorothy James is a writer, editor, and translator. She was born in and grew up in Wales, has spent significant amounts of time living in Vienna, and currently lives in New York City. Most recently, she is the author of two mysteries set in Vienna, A Place to Die, and A Place to Live, and of the blog My Place for Mystery. While her mysteries deal with serious topics–even beyond the murders in them–they are also wonderfully witty, sometimes laugh-out-loud funny, and fun to read. 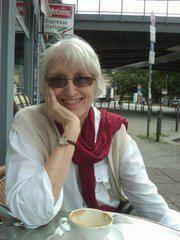 During her academic career, Dr. James taught German language and literature at the University of London and the City University of New York, and English language at the University of Saarbrücken in Germany. She has published books and articles on German and Austrian literature, including one on the Vienna of the 19th century playwright and actor, Raimund and Vienna, as well as many articles on the teaching of foreign languages. She has also published short stories. JH: First of all, can you tell us how your charming, poetry-writing, Viennese Chief Inspector of Police, came by his name? And a little bit about his namesake? Also, was there a real-life (or fictional) model for him, a starting-point, as it were, in creating his character? DJ: Giving my Viennese police inspector the name of Georg Büchner was a quirky thing to do, and some of my Germanist friends objected to the implied disrespect, since the actual nineteenth-century Georg Büchner is an icon of German literature and of German revolutionary politics. How did this iconoclastic name-appropriation take place? I was sitting in my little attic apartment in Vienna and amusing myself with the idea of writing a murder mystery. What shall I call the detective, I asked myself, and I began to picture the way he would look. Tall, thin, I thought, with an intelligent face and a twinkle in his eye. Into my mind came a student I had known many years before, not Viennese but German, though I met him in Paris, rejoicing in the unlikely name of Georg Büchner. It really was his name, this young man, a student of sociology who liked to talk politics, literature, philosophy, walking through the streets at night. Seeing before me in my attic this friend of my youth with his famous name, I wondered how he would look now, years later, and whether if I ran into him now, would he walk through the streets of Vienna at night, talking? I saw my Inspector Büchner, carrying his famous name into middle age and keeping the quizzical view of life, the political-literary bent, the thin, intelligent face of that young sociologist, namesake, and admirer of the great Georg Büchner. JH: You have a distinguished academic career behind you, studying, writing about, and teaching German language and literature. How did you decide to set out on your relatively recent work of writing murder mysteries? What are the unique challenges of writing fiction, especially mystery-writing? Did you turn to any particular writers of mysteries as role models in this venture? I did, however, launch into my first murder mystery, A Place to Die, for fun. Rather rapidly I realized that it was a bit of an illusion, this “writing for fun.” Yes, I did want to entertain, I wanted even to be funny, to make people laugh sometimes, but I could not altogether break free of a lifetime of trying to convey serious ideas, searching and researching into, through and behind what seemed to be surface reality. And so it happened that my murder mysteries are, I hope, fun to read, but they are in their way serious inquiries into certain aspects of living and dying. The unique challenge of writing fiction, any fiction, as opposed to writing critical-historical analysis, is that you have to create a good story-line, believable characters and a plausible background so that the reader eagerly turns the pages of the story, and does not feel assaulted by the ideas that are inevitably going through the author’s head. JH: You grew up in Wales and went to school there, then to universities in London, Munich, and Vienna. At some point later you made a move to the U.S., where you have become a long-time New Yorker. Then, for the first decade of the 2000s, you lived on and off in Vienna. Which of these places now feels most like “home” to you? And what do you appreciate most about each of these places? DJ: “Home” for me is, was, and always will be Wales. The nineteen years I lived in my parents’ house are indelibly imprinted on my psyche. I have never felt so completely “at home” anywhere else, with all the warmth, security, and love that this expression implies. Also all the traumas that one spends one’s life trying to emerge from. We lived in small valley towns in the South Wales coalfield (as it was called then), in close communities of chapel-going people. My father was a Baptist minister who had started life as a coal-miner at the age of thirteen. Seen from the outside, this was a narrow community, but inside there was warmth, love, support, poetry, music, a lot of singing, and it was undeniably home. Breaking away from it was necessary, inevitable, painful, and guilt-ridden. I have spent the rest of my life in big cities. I wanted the anonymity as well as the diversity and the excitement of the city. But since I left Wales, “home” is something I carry in my own head. I am quick to adapt and to create patterns of living in new places, and I have become absorbed in the life of the cities in which I have lived. An expatriate, however, does not easily grow out of the role of outsider and observer. When I go back to Wales, I still feel more of an insider there than I do anywhere else. Though in fact I belong more after all these years in New York City than in the Welsh valleys of today. JH: You made a decision to study German language and literature not too long after WWII. Was that decision prompted by a particular incentive of some kind? And how did you overcome any feelings you might naturally have had in going to study in a country that had so recently been “the enemy”? DJ: I did not consciously make a decision to study German language and literature per se. As a girl in school, I knew early on that my great love was for reading and writing, and since I knew that I would always read and write English, I wanted to be able to do this in other languages too. The other languages offered in my school were only French, German, Latin, and Greek (not even Welsh!). The best teacher, far and away, of any of these languages was the German teacher. He organized exchanges between us and German schoolchildren and schoolteachers, so that by the age of sixteen I had already spent a summer with a German family, and we often had teachers from Germany staying with us at home. My father had been a chaplain in the Second World War, and had survived the channel crossings of D-Day, the advance across the Rhine, and a year or two in the Army of Occupation. He was more than ready, as was my German teacher, to put the horrors of war behind him and look to a new era in Europe. So, yes, as you put it, the Germans had recently been “the enemy,” but a decade is a long time when you are young, and when I began seriously to study the language and literature of Germany and Austria, a decade after 1945, thoughts of the war were not very much in our minds as young people. I have thought a lot more about it since. At the time, I was, for example, enormously excited and grateful after getting my first degree in London to receive an Austrian Government Scholarship to study in Vienna for a year. This was purely and simply a dream come true. JH: One of the things I love about your mysteries is the way you weave contemporary social issues into the plot. I also love the very thoughtful, thought-provoking reflections that precede each chapter. 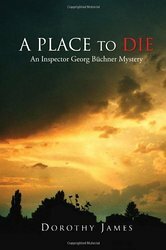 In your first mystery, “A Place to Die,” the main themes explored in this way were issues of old age, death, and dying. In “A Place to Live” you focus on themes of housing and immigration. What was the inspiration for each of these books? And why did you decide to set them in Vienna? DJ: I set my murder mysteries in Vienna many years after my student days there when I returned to Vienna from the U.S to conduct an NEH summer seminar for American professors. This was a great excuse to acquire an apartment there, and I kept it for a number of years. It was then that I had the idea of writing murder mysteries “for fun” and it was only natural to set them in Vienna because I was there, living in a little attic apartment on the outskirts of the city. And so I dreamed up Inspector Büchner and invented a story set in a fictional retirement home in the Vienna woods. At that time, my parents and the parents of my contemporaries were dealing with all the problems of old age and dying, and during the time when I was writing the novel, my own father grew very old and died at the age of 97. So the problems of old age, which had their amusing side when I started the novel, became deathly serious to me by the end. Hence my reflections on old age, death, and dying. 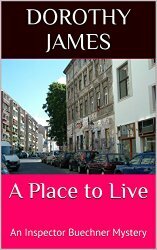 When later I thought of writing a sequel, I wanted a more optimistic title than “A Place to Die,” and so began “A Place to Live.” I had myself then found “a place to live,” in Vienna. That was in 2008. But again, the writing of the book extended over some years, and in that time my questions regarding “a place to live” became more than merely personal ones, as the growing immigrant population of Vienna created new and urgent political problems in the city. Since I finished the novel, these problems have reached crisis proportions with the recent influx of refugees and the attendant rise of the extreme right-wing, whose party, the “Freedom Party,” won 31% percent of the vote in the elections last month in Vienna. I did not think when I started the novel that these frightening political developments would cast such a dark shadow over its end. JH: How long did it take you to write each of these novels, and what kind of research was required? What did you love most about writing them, and what was most difficult? DJ: Each of these novels took a few years to write, because I was doing other things than writing during that time, but in any case, while I tend to write very quickly in spurts – chapters, sections – I need a lot of time in between for my thoughts on what I am writing to sort themselves out. I did research for both of them, but not quite in the way I used to do research. I used to spend days and weeks and months in libraries. Writing the novels, I did look up a lot, of course, mutatis mutandis on the Internet, but I also read the daily newspapers, from Der Standard in Vienna, the Berliner Zeitung in Berlin, to the newspapers written and distributed by the homeless on the streets of both cities. I walked a lot through the streets, sat in cafés, and listened to people talk. I loved doing this, but you ask what I loved most: I loved sitting at my window in my attic with a pen in my hand and a blank page in front of me. I no longer had the sensation that an academic critic was looking over my shoulder. I knew I could let my pen carry me wherever I wanted to go. DJ: Thank you for wanting another one! I don’t know. I probably cannot set another novel in Vienna, because I have given up my place to live there. Can these characters be transported elsewhere? Could Inspector Büchner crop up in New York City? Well, why not? That’s the great thing about fiction. All doors are open. Janet Hulstrand is a freelance writer, editor, and teacher based in Washington D.C. Her articles have been published in Smithsonian and the Christian Science Monitor, and she writes frequently for Bonjour Paris and France Revisited. Each summer she teaches “Paris: A Literary Adventure” for the education abroad program at Queens College of the City University of New York. She also teaches literature classes at Politics & Prose bookstore in Washington D.C., and Writing from the Heart workshop/retreats in Essoyes, a beautiful little village in the Champagne region. She is coauthor of Moving On: A Practical Guide to Downsizing the Family Home, and is currently working on her next book, “A Long Way from Iowa,” a literary memoir. Entry filed under: About Writers and their Work. Tags: Dorothy James, literary mystery, mysteries set in Vienna, mystery.